So today I restarted the production HTTP server by mistake! Whoops! How did it happen? 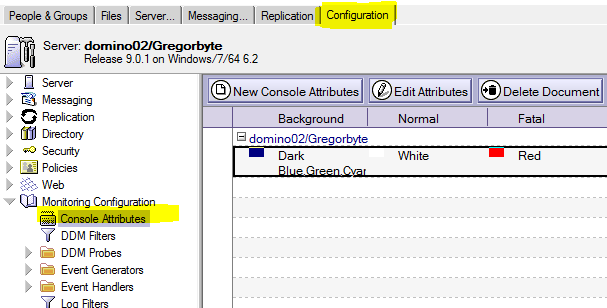 I do all my development on a local development domino server, and 99% of the time spent in Domino Administrator is on my development server, or another testing server. It was Monday morning, and had I forgotten that on Friday afternoon I had opened a production server to check some things. So I fired up Administrator and just assumed I was on my development server. Entered ‘restart task http’ and hit enter like I do so many times, and then noticed too late I was on the wrong server. Since making this mistake I have taken 2 steps to help prevent it happening again. I am not a Domino Admin so did not know about these things before, but a colleague pointed them out. Thanks Matt. I have set up a different colour scheme for my development server console. This way I will instantly be able to tell that I am on a development server. Now the dark blue background is a clear indication to me that it is the development server. Then, to make sure I will always be on my development server when I start Domino Administrator, I set the Domino Administrator Startup Settings, under File -> Preferences -> Administrator Preferences. and chose my development server. These options a probably well known by Domino Admins but us developers who don’t spend much time in Administrator may not know them. Hope it helps.